The Wyndham Lewis Memorial Trust is a registered Charity devoted to educational purposes, in particular the dissemination of knowledge and understanding of the work of Wyndham Lewis. The Wyndham Lewis Memorial Trust owns the rights to visual works by Lewis and to his writings. For permission to reproduce Lewis's paintings and drawings, please apply to Bridgeman Images. For permission to quote or reprint Lewis's writings, please contact Professor Paul Edwards, the Chairman of the Trustees, via Nathan Waddell. The Trust owns the largest collection of Lewis's works on paper, as well as several oils, including the great 1937 Red Portrait of 'Froanna', Lewis's wife. The collection is on long term loan to the Courtauld Gallery at Somerset House in London. The works on paper cover the full range of Lewis's working life, from 1900 to 1950. It includes works from periods not well represented in other collections. The collection is in the process of being photographed and scans will be published on-line when this is finished. 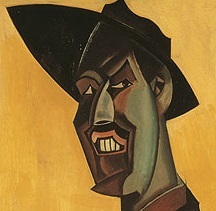 The Courtauld Gallery also owns two Wyndham Lewis works in its own right, including the iconic 1911 cubistic Self-Portrait. Paintings and drawings from the collection are sometimes on public display as part of the Courtauld Gallery's regular displays. It is also possible to make an appointment to view works in the collection that are not on display. To enquire about works on view or to make an appointment to see works in store please contact Dr Barnaby Wright.